Directed by George Miller. Written by Terry Hayes, George Miller and Brian Hannat. 1981. Running time: 94 minutes. The Western didn't die - it just, well, sort of mutated . . . or that's what I thought watching The Road Warrior on video the other day. Let's tackle the plot: a loner who speaks little (played by Mel Gibson) comes across a peaceful settlement that is being besieged by bad guys. Somehow he becomes involved with the people at the settlement and helps them out against the bad guys. Yup, that's the plot all right. But if you exchange "peaceful settlement" with let's say "peaceful community of farmers" and "bad guys" with "Indians" (in the Hollywood movies of yesteryear they weren't called native Americans) or "bad cattle rustlers" or whatever and you exchange Mel Gibson with Clint Eastwood perhaps, then you have a Western. Of course, you'll have to make them all ride horses instead of all kinds of outlandish trucks and cars, but you get the drift. Although the Western has been pronounced dead many times, it has simply been sublimated into the Hollywood collective consciousness. In fact, many times old Western plots have simply been retold with a modern even sci-fi, sheen nowadays. We often watch Westerns without realizing it - they just ride cars instead of horses and fire automatic rifles instead of old six-shooters. In the recent Soldier movie starring Kurt Russell, Russell comes across a peaceful settlement being attacked by bad guys and, well, helps them out. It's the basic Shane plot being redone once again . . . Even if movies don't always steal the Shane plot, they can't resist putting in some other Western element. Take the Mos Eisley canteen scene in Star Wars: exchange Luke Skywalker with some similarly green character and Ben Kenobi with the older (and meaner) gunslinger and you have a scene which has been replayed numerous times in countless Westerns. 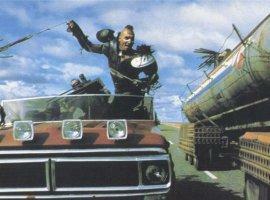 The plot of The Road Warrior may be old hat, but what its director George Miller came up was totally unexpected. The first Mad Max movie's plot was a standard revenge tale: bad motorcyclist gang kills cop's wife and kid (is there any other kind? ), cop kills them all. So what to do in a sequel? Let some other bad guys kill off yet more of Mel Gibson's relatives? Like those endless Death Wish sequels in which repellent criminals will inevitably wipe anybody who comes within a few meters of Charles Bronson out - thus inducing Bronson to kill them off once again? No, The Road Warrior steals another Western plot - but wisely spends it bigger (than the first movie's) budget on more lavish car stunts and special effects. If some of the action sequences in Mad Max reminded you of a demolition derby, then Road Warrior will drive this analogy home. The end chase is one over-the-top demolition derby, filmed with the same grittiness and surrealness that marked the previous film. People seeing The Road Warrior for the first today may not be too impressed with it: in the meantime we have seen many imitations and its (inferior) 1985 Mad Max Beyond Thunderdome sequel. It isn't, for example, as spectacular as Costner's Waterworld. Some of today's epics will no doubt look more like a music video than Road Warrior, with faster editing and more "artsy" camera angles. Also, Brian May's relentless Bernard Hermann-like music score may seem archaic to today's audience. But despite this, the sheer realness of all the stunts, the camerawork and landscapes will pull it through.